Tara Beckley is escorting a professor to speak at her university when tragedy strikes. A runaway van collides with Tara’s CR-V instantly killing the professor and sending Tara careening into a nearby river. A short time later, Tara awakens to discover she is fully conscious and aware but unable to communicate with the outside world – a victim of “locked-in syndrome”. Private Investigator Abby Kaplan has been hired by the university to look into the accident and remove any shred of liability on their behalf. As she digs deeper, she begins to uncover that this was no simple accident, but rather an execution. Can Abby put together the pieces before those that eliminated the professor return to finish the job with Tara? I received a free copy from the publisher via Netgalley for an honest review. If She Wakes reads like a script for a Liam Neeson or Keanu Reeves action thriller, although I’m not sure if either of them would have a role to play. It reminds me of the type of movie I would have rented on a Friday night in my early twenties when I was obsessed with low-budget action flicks. The novel’s principal protagonist is an Irish mobster who came of age as a member of the IRA during the 1980s. His dispatched hitman, Dax Blackwell, is a great villain and the perfect adversary for Abby – a former Hollywood stunt driver. I felt the scenes they shared were the best parts of the novel as the duo played cat and mouse. As for the plot, I found things got a bit too silly and a little too unbelievable. I wasn’t big on the twist in the novel’s finale and I didn’t much care for the character of Lisa Boone, a government agent racing against Dax to retrieve the professor’s lost phone, as I felt she added yet another layer to an already convoluted plot. I will say there are two things I didn’t like outside of the actual content of the book. I really do not like the book’s title and I very much dislike the cover. If I didn’t have prior experience with Michael Koryta (his novel The Prophet is exceptional), I wouldn’t even pick this one off the shelf. Maybe it’s the plethora of “The Girl with/that/who” titles that are just clogging up the shelves nowadays coupled with the fact that Tara is basically awake the entire time. I know you shouldn’t judge a book by its cover, but sometimes you can’t help it. 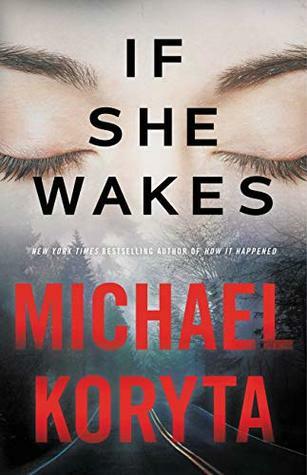 All negative criticism aside, If She Wakes is surface-level storytelling that hits the highway and speeds to its destination, despite that it is on a road that is littered with potholes.